The side circles, will be replaced by a trapezoidal shape somewhat in the 70s. 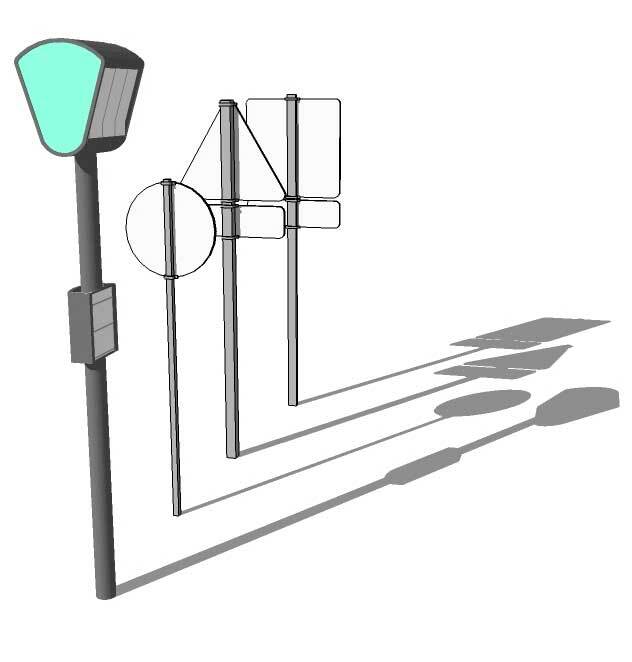 In addition to make a cleaner volumetric form with no protuberance, It provides a distinct shape to the bus stop, easy to discriminate from the road signs, which are mainly circles, triangles and squares. 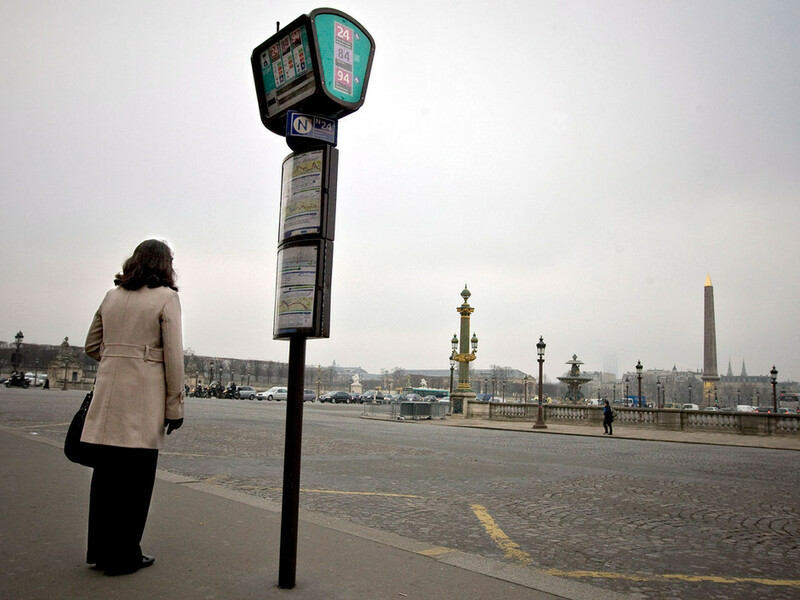 Today, the same bus stop (slightly relocated at the time of the renovation of the Louvre in 1983-89), has kept the same form. 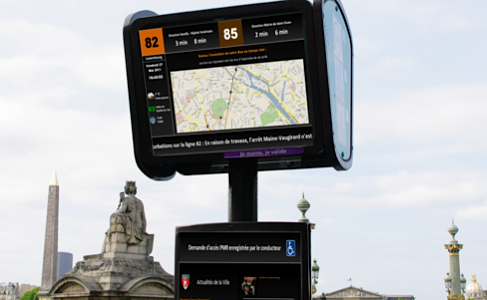 Modern technology able to provide real time information is integrated into it. The color scheme, green jade, is the one used by the RATP since 91. 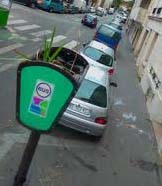 The Parisian bus stop is so versatile, it is used as a flower pot, by some urban gardener activist. En route from The Louvre (old regime) to the Arc (new regime), it happens to be the Concorde, where the last french king, Louis the XVI has been guillotined. Where French celebrates is on The Champs-Elysées, between the Concorde and Étoile, a vast public space able to contain one million people, with huge plazas, Etoile and the Concorde providing very comfortable overflow, and entry/exit point. 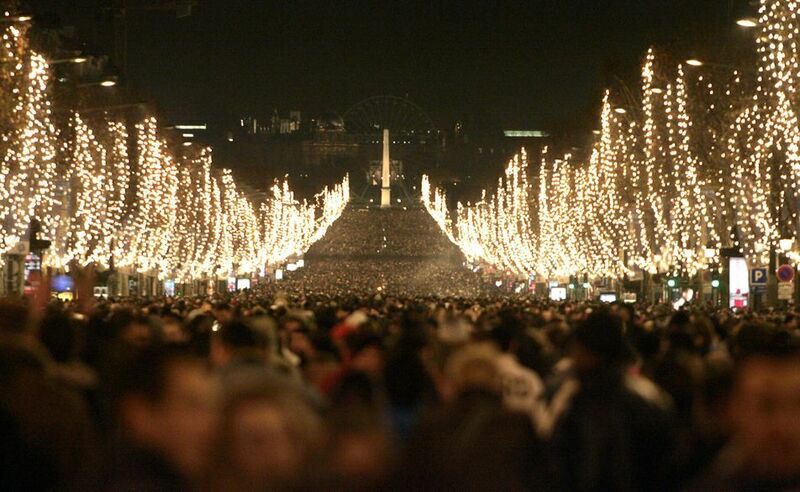 The size and topography of the Champs-Elysées help people to appreciate the size of the crowd. The celebration like above suppose to close the 10 lanes of traffic the avenue is normally supporting: A celebration on the Champs-Elysées means not “business as usual”. Those points are usually République-Bastille-Nation, in that order! A plaza in word, a park in theory, this almost perfect square, is a hit with many urbanistas for good reasons.. like Rome’s Piazza Navona, reaching Place des Vosges requires journeying along minor, often hidden streets. Then away of the crowd and noise of the surrounding city, you find an intimate, secluded, and still comfortable place. The square dimension, 127×140 meters,as well as the building lining help it, contribute to it. It is surrounded by a street allowing a light amount of traffic contributing to a safety feeling at any time any season. 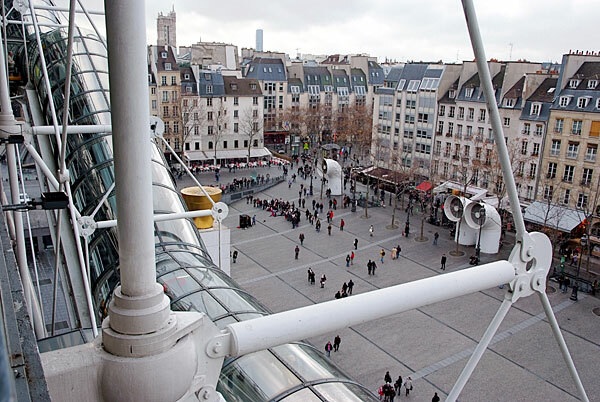 It is facing a Modern art museum known as Beaubourg built at the same time by the same architects. Like Sienna’s Piazza del Campo, the 170x65m square has a slight declivity along its narrow edge, which allow people to appropriate the space like it was a beach: it is not uncommon to see people sitting on the pavement, facing the museum, which happen to have corridors and stairs on its outside facades, offering continuous movement of people to watch from the square. 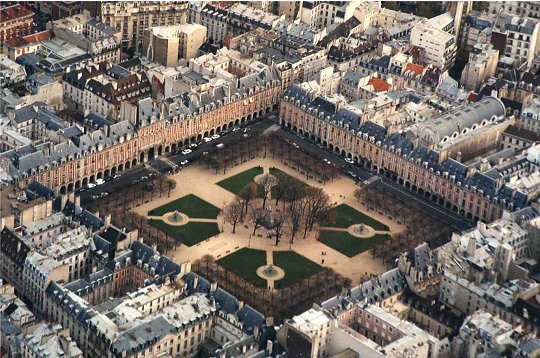 At the difference of Place Des Vosges, this square is fully pedestrian, and is surrounded by cafes and other shops. 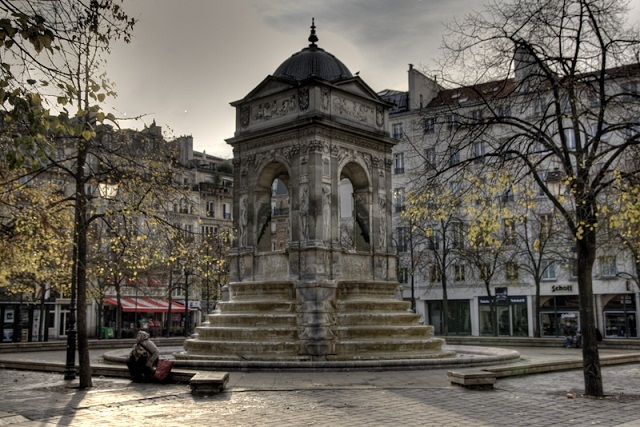 When they need to meet, Fontaine(fountain) des Innocents is the natural rendezvous. 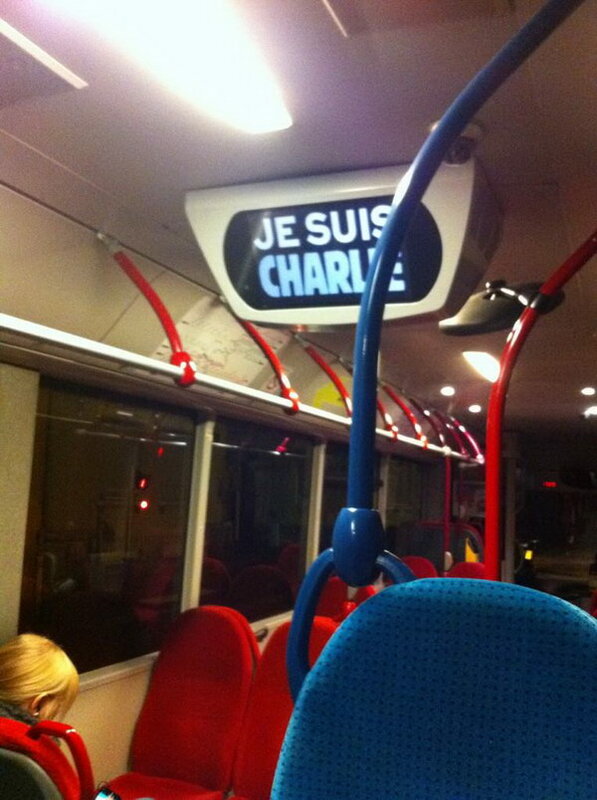 It is at the cross road of the main Parisian arteries. This square is also surrounded by Cafes. This size could be not purely arbitrary, and could have to do with our field of vision- we tend to not recognize people beyond this distance and from smaller distance, we tend to be able to describe people facial characteristic – the ~100 meter range lie in between . Historically, it was defined by rue St Honoré for the west branch, and rue St Denis (doubled by rus St Martin) for the North Branch. 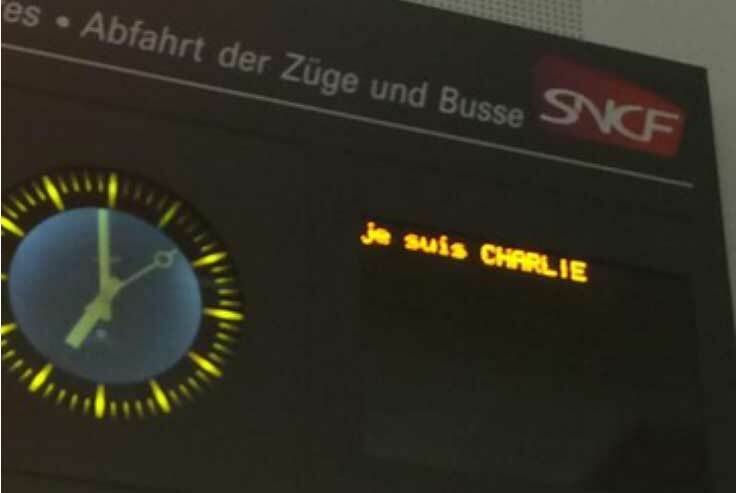 Mostly to resolve traffic issue, This cross will be doubled by the rue de Rivoli (West branch), and Boulevard de Sébastopol (north branch) . 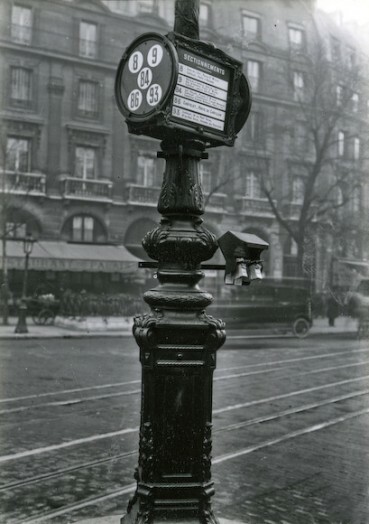 In 1900 the cross will be doubled by the subway: line 1 for the East West axis, while the line 4 will roughly follow the North-South axis – they are respectively the first and second most used subway lines of the network. 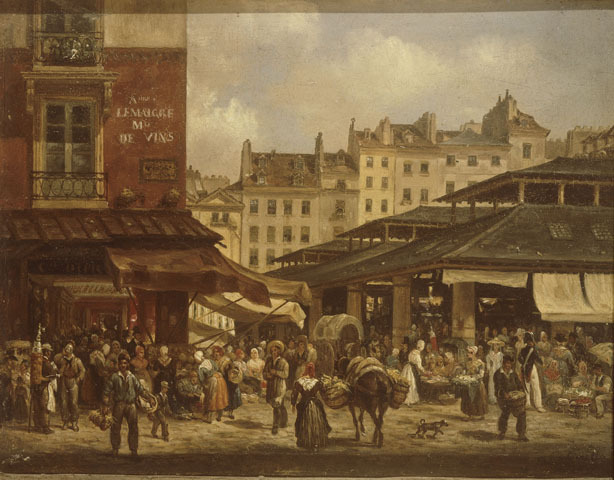 Thought a market was officially existing since Louis VI the fat, circa 1117 – which in fact was instituating a function already occurring on a necropolis site – Les Halles history starts in 1183, when the King Philippe II Augustus decided to move a trade-fair on the site called the Champeaux. A history version suggests it was a Jew ghetto – Philippe II Augustus will have expelled them and seized their goods and houses in 1182 -then build two covered market in 1183. They are thought to have been massive enough-100metres long and 10 height, with a vaulted ceiling, all in stones – to have impressed their contemporaries: they will be called “Hala” (halles in french, the English term “hall” is poor translation, and we will keep the french term) and it is the beginning of the story. At first the market food trading is marginal. 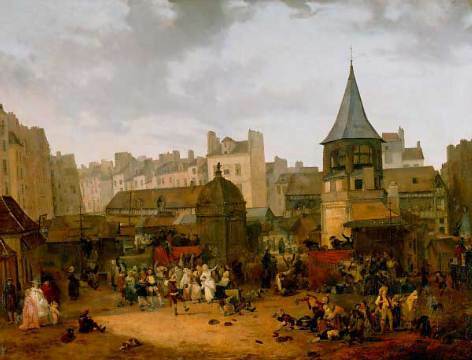 The market will start to flourish then will decline in the 14th and 15th centuries and the halles will fall in ruins. A Francis I reformation ordinance in 1543 will try to correct that. 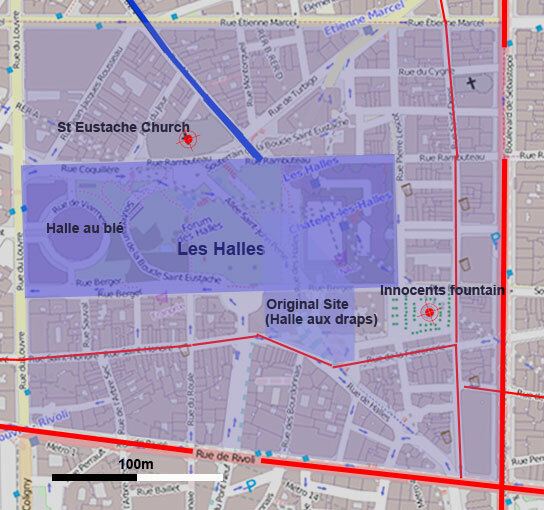 New halles will be erected to extend and replace the old ones circa 1551, that along market organization changes. The emergence of new trading usage (shop…) will make the market focusing increasingly on food trading. Soon enough it will be known as the largest market in Occident. It is a relatively unassuming Gothic style church, with an unfinished and at odd neoclassic frontage  – the kind of you can expect in many french cities. Its recognized best profile-highlighting its gothics features slighlty enhanced by some renaissance style details- is seen from its South East side, basically from the Innocents fountain. It is the obvious landmark of the neighborhood. 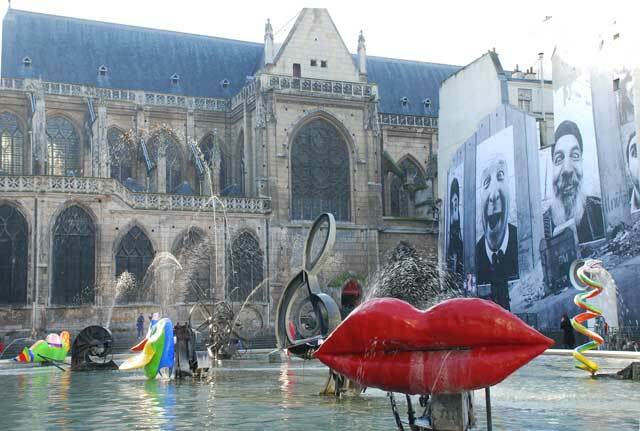 Most of the photographs and paintings of the district include it whenever possible: When you see St Eustache, you know where you are. Easy to find. On the way, more exactly on the historic Montmartre road axis- between the Halles and the “great cross” intersection- and dominating the middle of an unencumbered and well defined ~80mx60m square: a size big enough to accommodate a substantiate activity making a good hangout, but small enough to be able to recognize a person in it (see the notion of social field of vision in ): this unassuming structure is a landmark: it is “THE” meeting spot of the Halles. Notice the today square’s name, place Joachim du Bellay, is virtually unknown, overwhelmed it is by the “Innocents” fountain name everyone know. The fountain- thought have been existing since 1274 – has been a bit peripatetic. Originally this site was a cemetery, the St Innocents cemetery, and the fountain was sitting at the NE corner of it. A cenotaph was sitting in the middle of the cemetery. The cemetery- an “overflowing” mass grave-the level was 2meters above natural level – surrounded by an ossuary, has been closed circa 1785 under hygienist concern of the time and pressure of the neighborhood complaining about its “mephitic” odours  (the cemetery has been transferred into the catacombs) . The fountain has then replaced the cenotaph. Though merchants was conducting business in the cemetery before its closure, it became the regular market we see in the photo above in 1789-as planned by a 1750s plan. before be surrounded by shelter for merchant, circa 1811-1813 , the Innocent market will receive 400 red parasols in 1800 , an anecdote which will eventually have a huge influence on the future of the site. 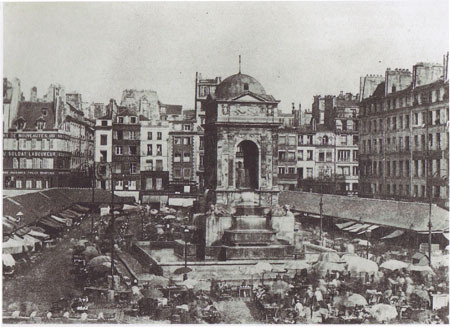 The Innocents market will last up to 1858 when it will be relocated in the Halles Baltard, and give room partially to a park, an opportunity to relocate the fountain for the last time so far. 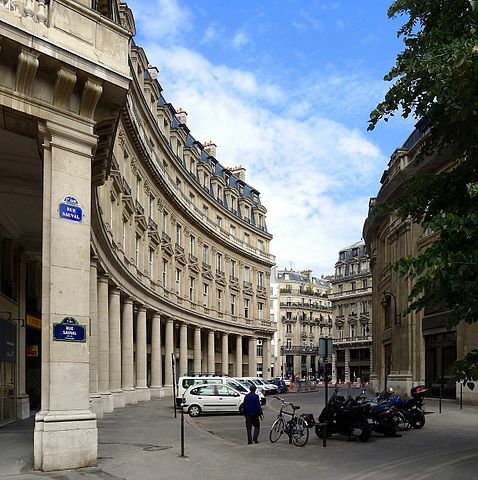 In its today form, this building could have eventually been a landmark in a provincial city, but in the Parisian landscape, it looks like another official Parisian building… Its circular and repetitive from makes it a poor orientation helper. The lately added main entrance on its west side, make the building turning its back to the Halles site. 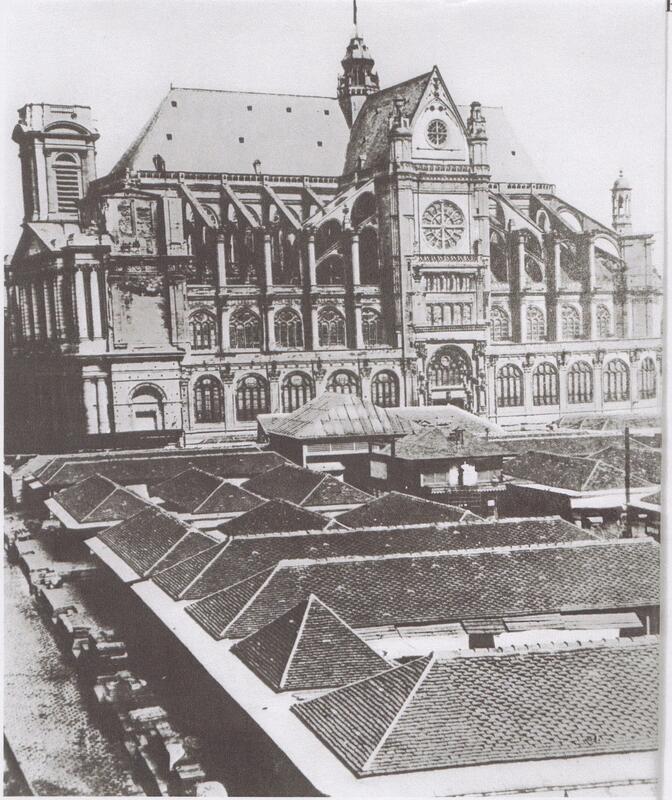 After another fire in 1854, the building will be closed in 1873, and radically transformed by Henri Blondel in 1885, to give its today appearance, and to host a commodity trade market. The surrounding buildings have followed a similar track. 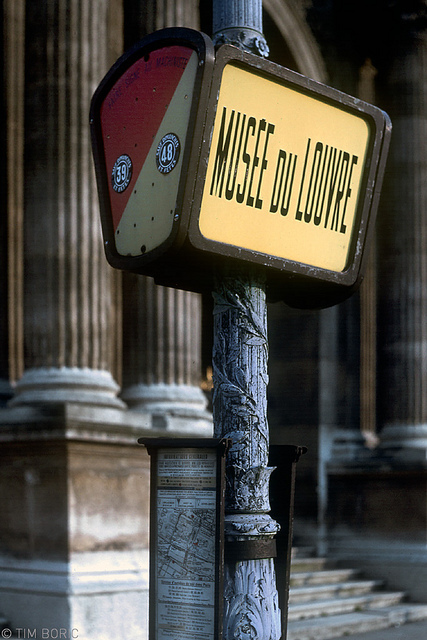 It is the column seen next to the Halle au blé building. Commissioned by Catherine de’ Medici in 1574, it predates the building itself, but has always stand still there a bit at odd. 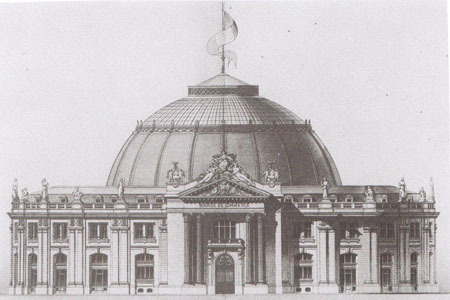 Blondel was planning to demolish it in the context of its renovation work: Jean Charles Alphand, to whose Paris owns most of its most celebrated parks, will have intervened against such a fate. 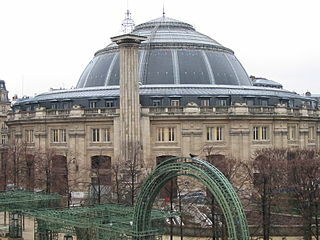 We mention this building because it was probably the traditional shape of the non food related Halles, and it relates to what have once been one of the most important and flagship trade activities of the medieval halles of Paris: drapery. 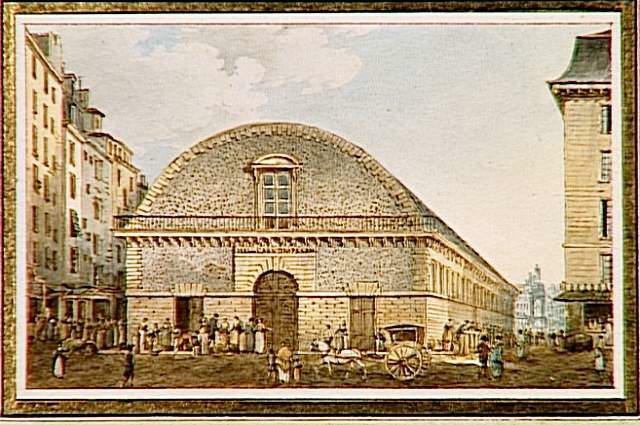 The Halles, for the food related market, are largely very medieval in their typology, and the last addition like the Prouvaires market built by Jean-Jacques-Marie Huvé between 1813-1818 (see photo above) or the halles for the fish and butter market, built in 1822 by Hubert Rohault de Fleury, don’t revisit this style, thought they are almost contemporary of the Covent garden market in London. 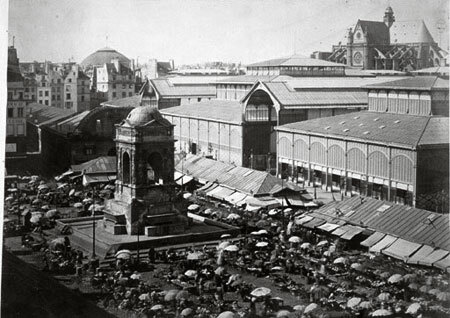 the market is the largest known central market of its time and live mostly at night: people, including 7162 counted sellers, start to come around 11pm, to serve an estimated 40,000+ customers, and are supposed by bylaw to have freed the street by 9am or 10am (in winter). Traffic is a huge issue- there are counted 4,000 carts occupying an additional 2 hectares. handcart, basket storage, and livestock occupy an additional 0.5 hectares (number above from ,  provides similar numbers, 5.5 hectares for the whole market). The area is a fertile ground for endemic prostitution and other activities associated with more or less shady nightlife . The retail market is functioning all the day, making the area active 24hr a day. it was kind of an European tradition when the government was in need of money. We refers to the June 24, 1182 expelling ordinance. 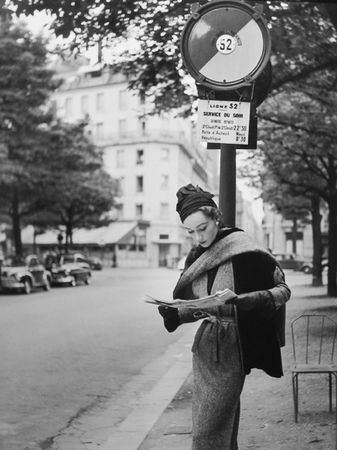 It was called la “Juiverie des Champeaux”. This version doesn’t appear- neither is dismissed- in the recent literature (like ), but up to recently the literature was frequently referring to  to support this version. 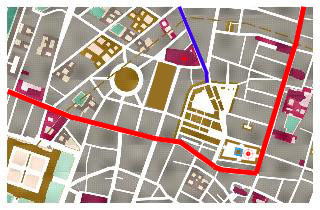 The Rue de Rivoli (street) has been opened in different stage between 1806 and 1835, for the Western part, and the last section completed in 1855 . It used to be chapel, St Agnès, built in the 13th century. The construction of the current church began in 1532, the work not being finally completed until 1637. Jean Hardouin-Mansart de Jouy has started to had a new neoclassic style frontage in 1754. The work will be continued but not finished by Pierre-Louis Moreau-Desproux up to 1772. The original fountain with only 3 exposed faces- has been redone in its current style by Jean Goujon (sculptor) and Pierre Lescot (design)- 1546-1549. 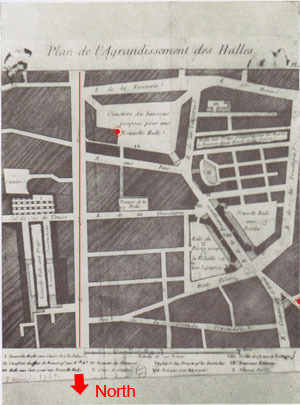 The fourth face has been added by Auguste pajou in 1788, when the fountain has been relocated in the middle of the place. 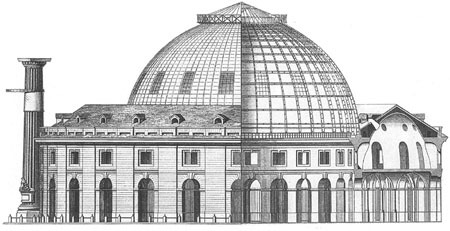 Urban Renovation, Moral Regeneration: Domesticating the Halles in Second-Empire Paris, Victoria E. Thompson, French Historical Studies, Vol. 20, No. 1, 1997. “Question du déplacement de Paris,” Lanquetin, Prefecture de la Seine, Commission de Halles, April 1840 (as cited by . 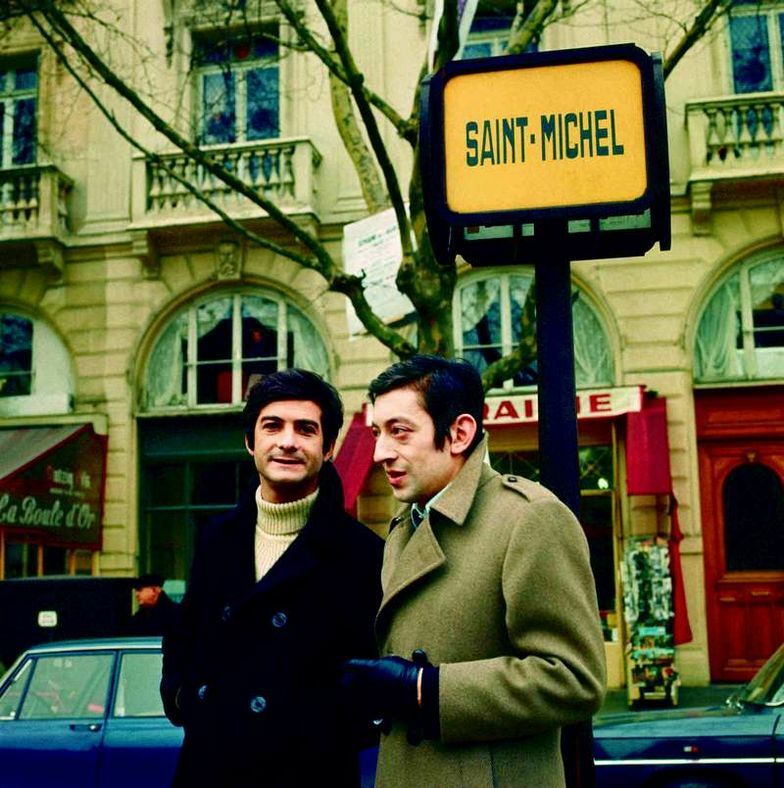 On what could be probably considered as mere cosmetics by many, the France’s Head of state, Nicolas Sarkozy carries all his weight into a battle, engaged by franc tireur Jean Christophe Fromantin, involving the Mayor of Paris and having as soldiers no less than architects like Castro, Foster or Pei….Why that? Because behind an apparently benign Boulevard configuration, what is at stake is 2 fundamentally different visions of the city. 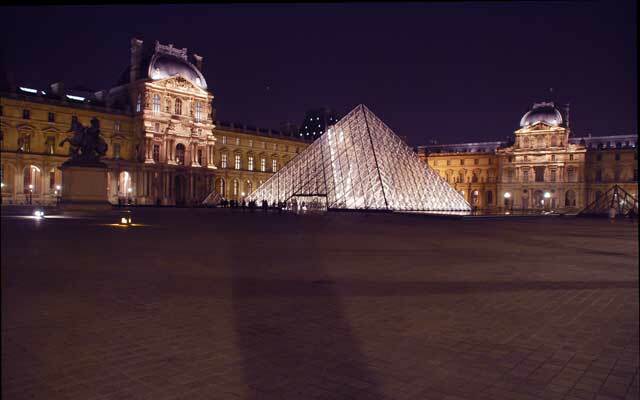 Neuilly sur Seine, tucked on the west side of Paris, between the Champs-Élysées and la Défense, and bordering the magnificent Bois de Boulogne parisian park, is the most affluent Parisian suburb. 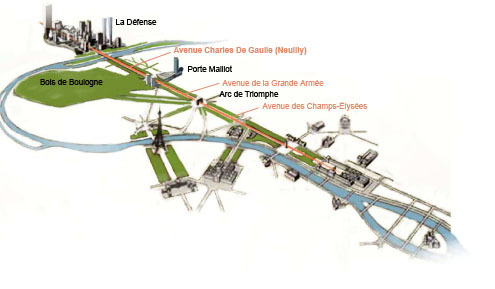 Its Avenue Charles de Gaulle, linking Paris to La Defénse, in the Champs Élysées alignment, is part of the Royal axis, envisioned by André Le Notre in 1640. Nowadays this 70 meters wide avenue carries a staggering amount of traffic, ~150,000 vehicles/day . 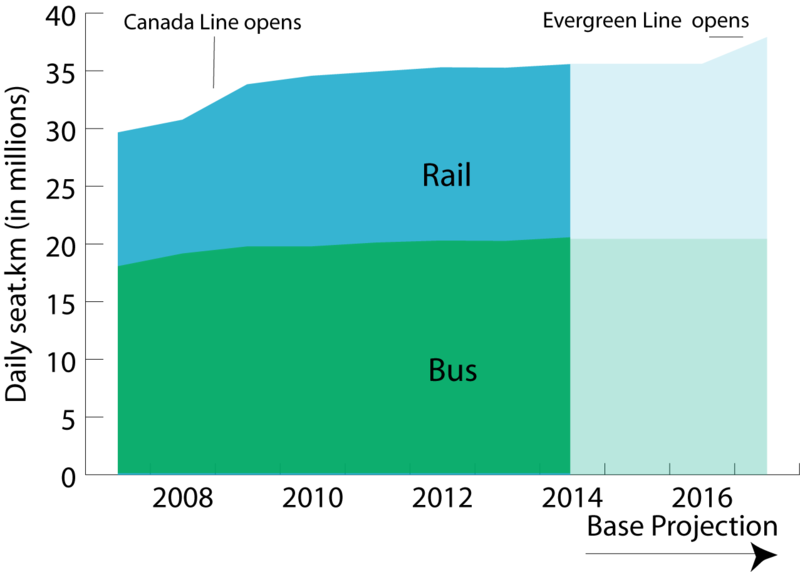 That is only the tip of the iceberg: 80% of the trips occur in fact below the surface, where run one of the world busiest subway line and one of the world most busiest train line . 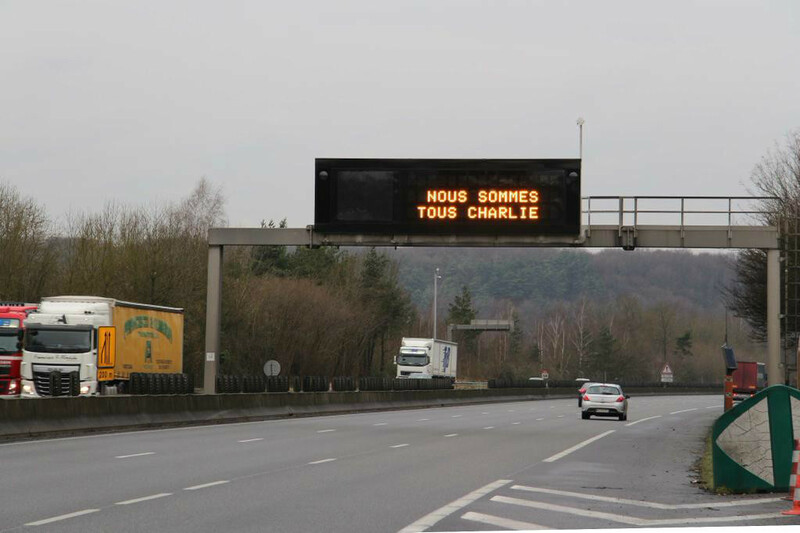 The Charles de Gaulle avenue is treated as a freeway. 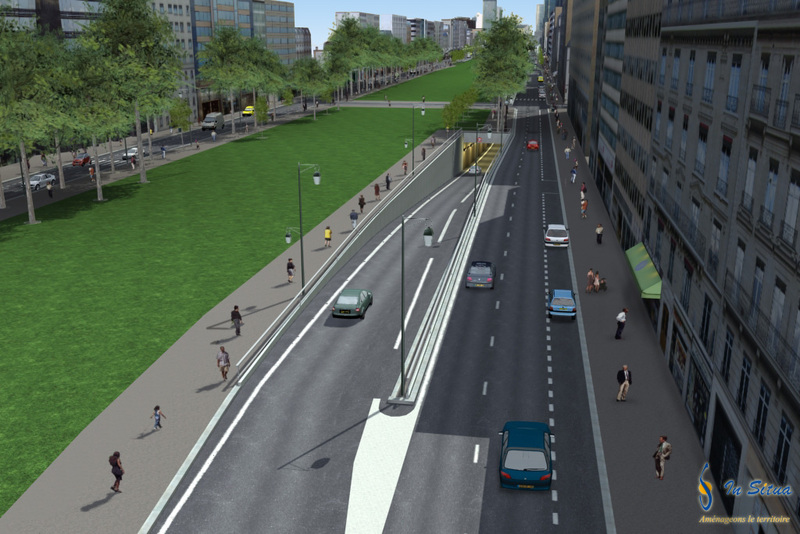 On its 70 meters wide, one can count up to 20 lanes of cars (including parking)! 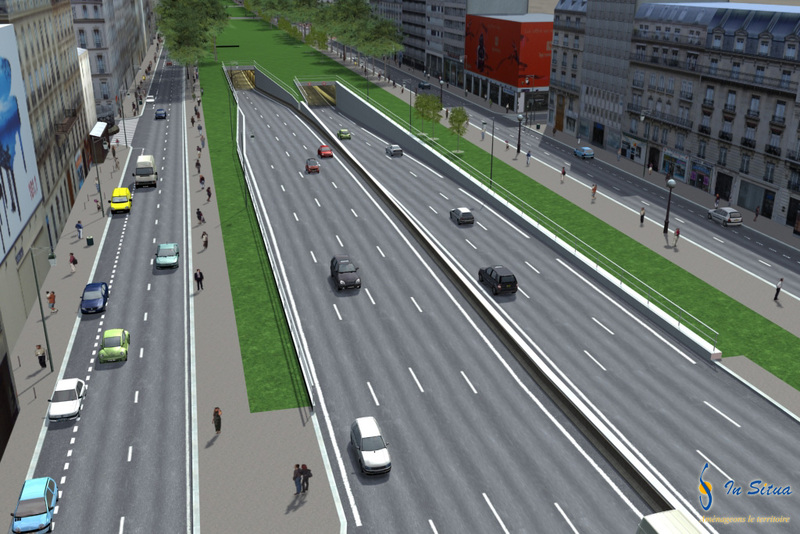 Avenue Charles de Gaulle is also part of the national road network (where it is then called RN13) and is considered as a strategic axis, under direct state supervision. Nicolas Sarkozy was mayor of Neuilly, a right-wing stronghold, before winning the presidential election in 2007, and was then carrying the burying project of the RN13 road. At the 2008 city election, he was endorsing his protege David Martinon to be his successor for Neuilly…It should have been a formality matter, but a franc tireur, Jean Christophe Fromantin came into the way, and will be elected Mayor of Neuilly (60,000 inhabitants) at the great displeasure of the Sarkozy’s clan. 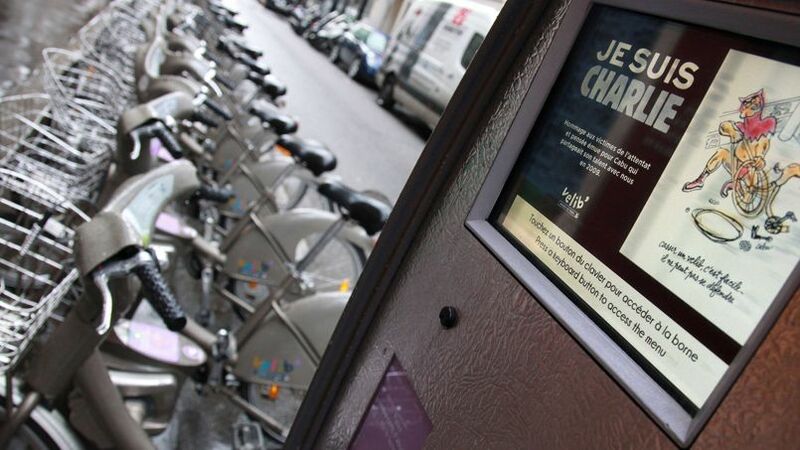 To mitigate the damage, Jean Sarkozy, the President’s son will be candidate, and be elected as expected, as a district councillor for a Neuilly ward. He will be vested instantaneously as the wip of his party, which incidentally control the district council (1.5 millions of people), and will be also president of the District’s Transport commission. The Paris Regional area, like Paris is under control of the left (PS): Jean Paul Huchon is president of the Paris regional council (which oversight 12 millions people) while better known Bertrand Delanoë is mayor of the influential Paris city (2 millions inhabitant). 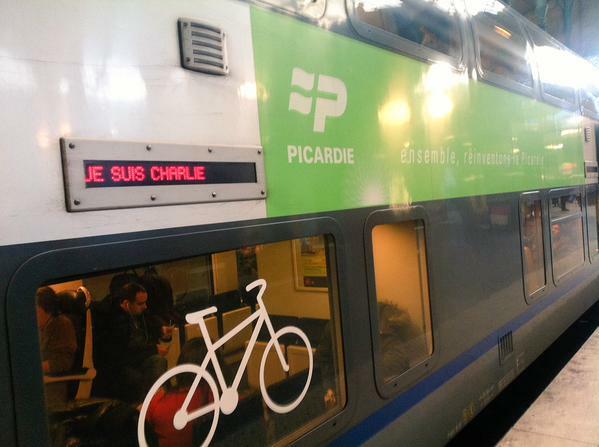 All of the above political actors have an opinion on the tunnelling under the Avenue Charles de Gaulle. We shouldn’t forget the still powerful prefect of Paris, Daniel Canepa, appointed by the president, and in charge to represent the interests of the “state”. The cost of tunneling 1.5km of road, €1 billion, can also buy 8km of Express subway tunnel, and that is more inline with the regional priority. 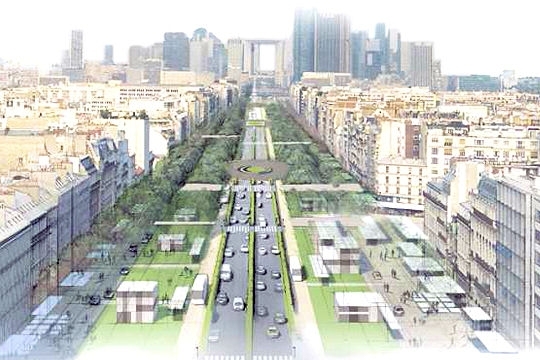 The large grassed median avenue is modeled on the Avenue de Breteuil in Paris, an avenue commending some of the highest real estate price in the city. Thought it is pretty, it is also dull and lifeless. The social and economic justification of this project is basically null , nevertheless this pastoral vision is the one supported by the Sarkozy family. Tranquility of the neighbors is not the main objective anymore, the main one is to create an attractive urban space. Pont de Neuilly, links Charles de Gaulle avenue with La Défense or rather its huge intestines... the huge pedestrian mall at La Défense is virtually not accessible by foot! 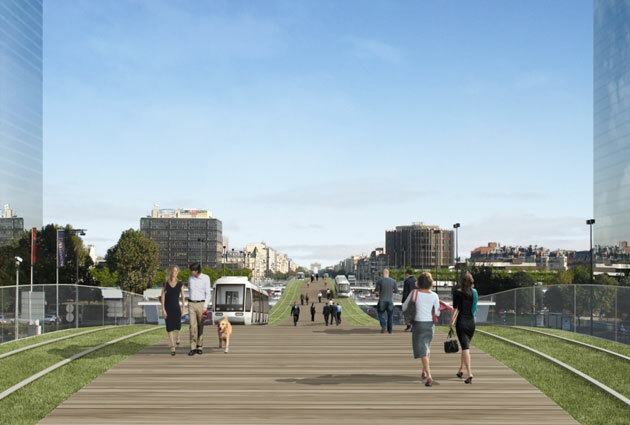 But in fact, with the project maturing , Porte Maillot, connecting the avenue on the eastern edge, is affirming itself as the project’s gravity center. Porte Maillot has long been neglicted, not to say that its potential has been ignored by architect like Le Corbusier . 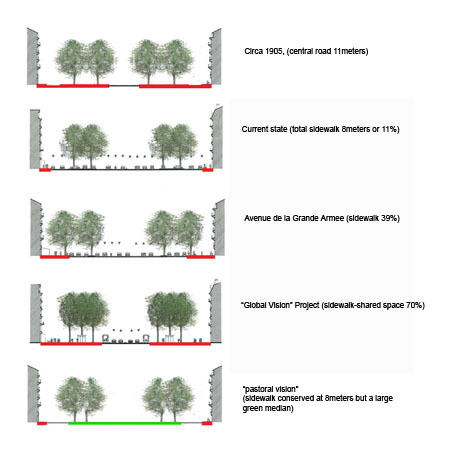 It is technically on Paris territory, so it can looks curious to see the Neuilly’s mayor proposing the redesign of something not under its jurisdiction, but he probably didn’t do it without involving Paris city-hall. In such instance, it is expected that the residual surface traffic to be an healthy 30,000 to 40,000 vehicles/day, when 85,000 to 150,000 could travel into tunnel depending on the toll options. That is certainly a Gordian knot. Clearly traditional metrics can’t justify such a project. without toll traffic is expected to be 150,000 vehicles into the tunnel. with a €2 toll, traffic is reduced to 85,000 vehicles into the tunnel…other vehicles finding alternative ways (a priori the study doesn’t expect a report on public transit) …Toll revenue is estimated at €35 millions/year, not even close enough to cover the debt service. 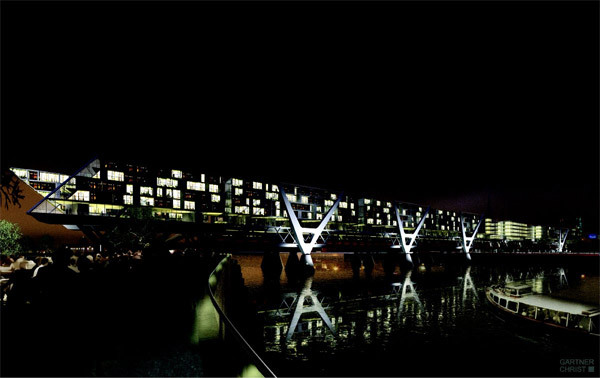 Rem Koolhass, scheme captures pretty well what is the essence of the Paris metropolis. and one of it is that La Défense, long considered to be an eyeshore having nothing to do with Paris needs to be reappropirated as part and defining feature of the city, pretty much like “The city“-obviously full part of London- is. When come branding, one can think of the Olympic games or World’s fairs to put a city on the world stage: A whole new dimension where €1 billion to define a city image is not necessarily considered as extravagant! Urban affairs have been for long a domain for enlightened dictatorship preferring confrontation to compromise…Rare Departures of it, like has been done at the Halles, have usually translated in disasters: As theorized by Haussmann, Paris is a city of Nomads and immigrants…why ask for their opinions?…Paris belongs to France… – and the most celebrated Parisian modern architecture piece, Pompidou centre by Renzo Piano and Richard Rogers, and Louvres Pyramid by I.M. Pei have suffered not a single input of the Paris public- architecture without compromise….But the intricacies of the french political system and public interest in urban affairs is such, that “enlightened dictatorship” in urban matter can’t exercise without a certain level of support  which request a ‘dictator’ with an urban vision showing breath and ambition. 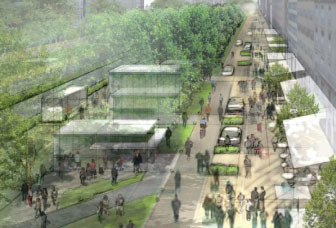 The place and level of traffic in the city, but overall more importantly a question on the desired environment, a”pastoral” vision versus an assumed “urban” (Is all that green that good?). 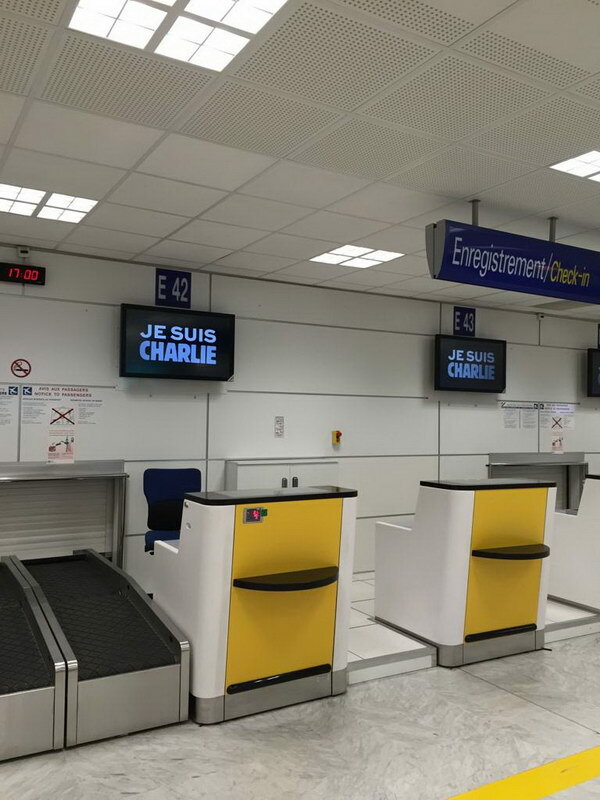 There is little questioning in France, on excessive activities centralization and almost obscene wealth concentration , eventually forcing people to live far away of their work place and putting incredible stress on the transportation system. Indeed, to relieve an “overcrowded” transportation system feeding La Défense, they intend to build more of them, defacto reinforcing a vicious circle: an area becoming increasingly attractive…but eventually at the expense of many other parts in Paris…and tremendous cost of negative “branding” like the 2005 riot, and ways to address the root cause of it, don’t seem too much on the decision maker’s radar. It is also curious to see that the very “provincial”, if not outright primitive, Sarkozy’s approach has been able to go without questioning for so long. That is certainly due to the fact that Neuilly sits outside the Historic Paris core and as much as careful attention is given to any thing occurring into the city historic limits, as less as there is concerns on what happens other side of the Boulevard Péripherique, which acts as a barrier between the historic core and its metropolitan region, as efficiently as the citywall it has replaced. 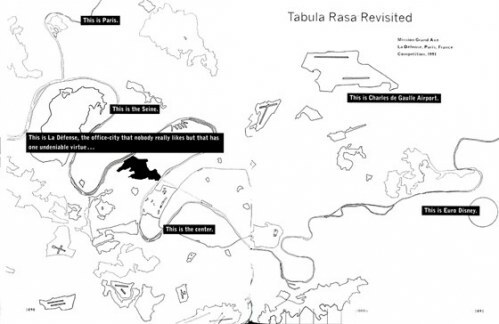 General attention has started to be given to this project once people have understood it was defining Paris. Unless otherwise noticed, pictures credit to  and . It makes the third busiest road of France, the 2 others one being freeway A1 and A6: Not even the Port Mann bridge in Vancouver area carry close to this amount of traffic. 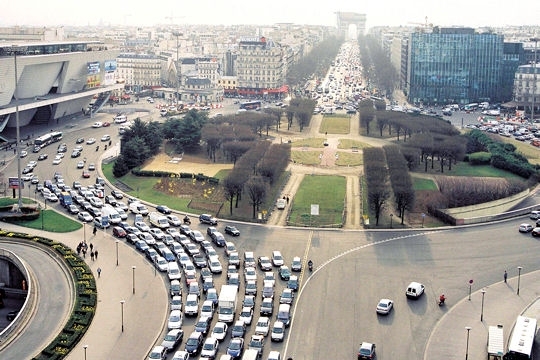 The Champs-Élysées itself carries ~85,000 vehicles/day. Metro line 1, and RER line A (a regional express train line). 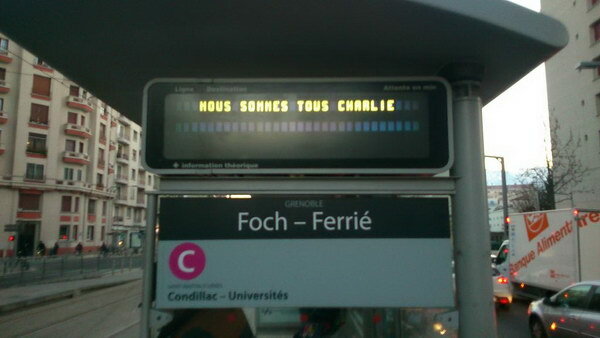 the extension of the RER line E is also scheduled. 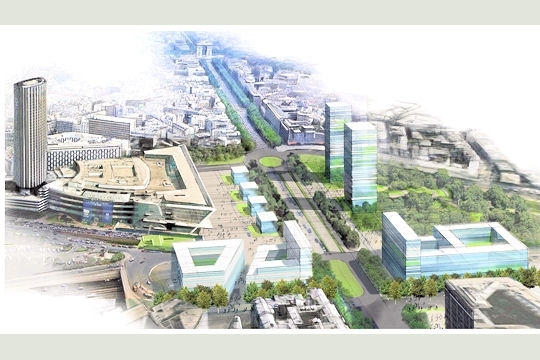 Jean Sarkozy will be also “recommended” as to be directing the “La Defense” administration which is the most important European Business district. 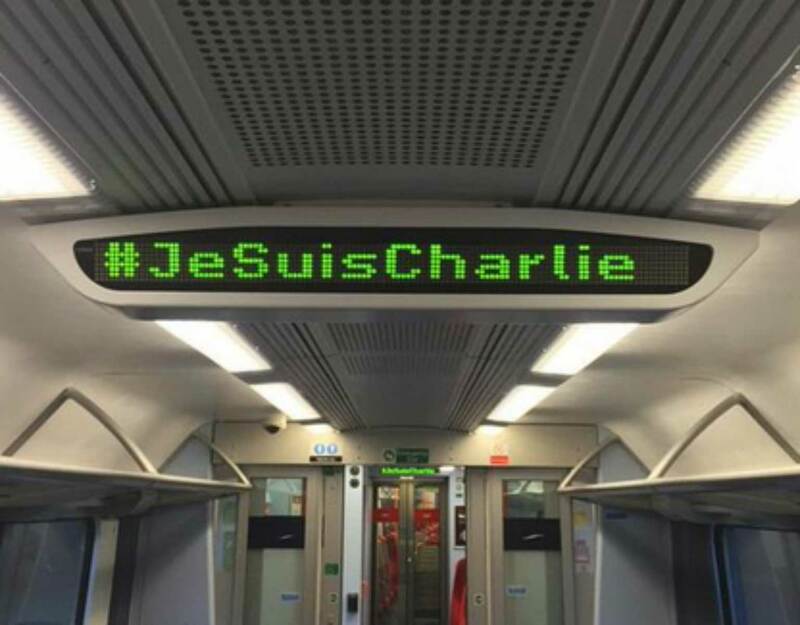 This has created a public outrage, and plan has not been pursued. axe majeur, third public meeting minutes, Feb 7, 2011. 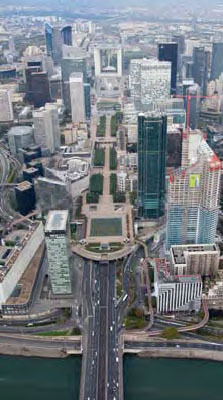 This area got tested with the high rise idea in the 30’s: the section between the Arc de Triomphe and la defense was supposed to be developed as the Triumphal way, and a parisian properties developer, leonard Rosenthal, privately organised a consultation for the study of the architectural treatment of Porte Maillot (to be then called ‘Place de la Victoire’), which saw lot of emphasis on High rises. The government itself will have organised late 1931 another consultation which has resulted in more conservative submissions but will have not followed suite on it. 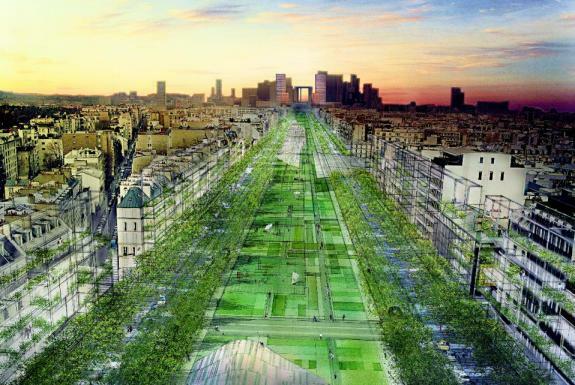 The French urbanists society will recommend la Defense, rather Porte Maillot, to experiment new architecture urban form …and here we are! S,M,L,XL, Rem Koolhaas, New York, Monacelli Press, 1995. 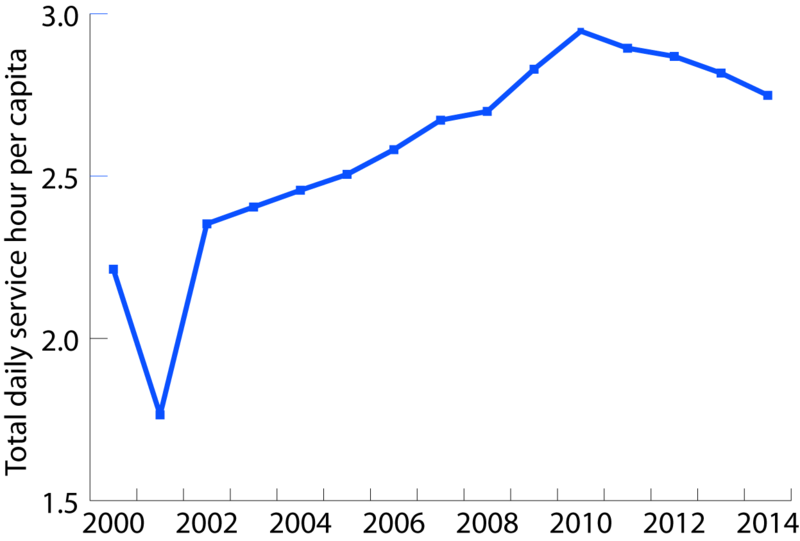 Jean Christophe Fromanin, gaining 70% of the vote has defeated Marie-Cécile Ménard in a 2011 district election. 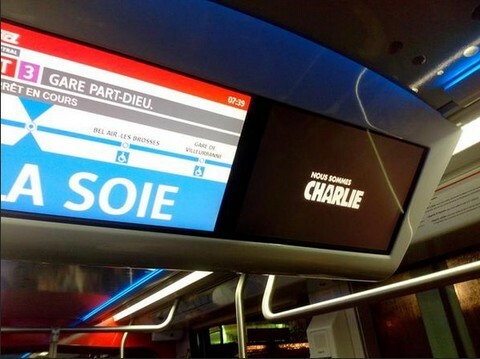 the later was occupying the district seat of Nicolas Sarkozy for his district seat. Les Hauts-de-Seine jugent “inacceptable” le plan d’aménagement de M. Huchon, Béatrice Jérôme, le Monde, June 28, 2007. 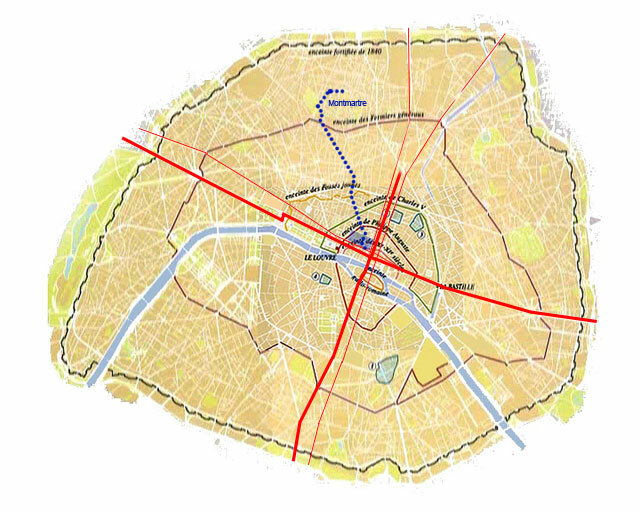 Originally, Fromantin was advocating for 2×2 lanes tunnel with no intermediate access, and a 2×3 surface lanes boulevard, when the Sarkozy family was advocating for a 2×3 lanes tunnel with intermediate access complimented by 2×2 surfaces side lanes… To date the State administration says that the traffic prediction support a 2×3 lanes tunnel, but agree against the intermediate access. Quel bilan socio-économique pour le tunnel sous Neuilly ?, Frédéric Heran and DARBERA Richard Darbeda, Transports, no438, 2006. The initiative will be renamed “axe majeur” in the years 2008. Enfouissement de la N 13 : Sarkozy s’impatiente, Le Parisien, July 6, 2009. Enfouissement de la RN13 à Neuilly: la mairie de Paris approuve le projet, AFP news via Le Point, Dec 16, 2010. 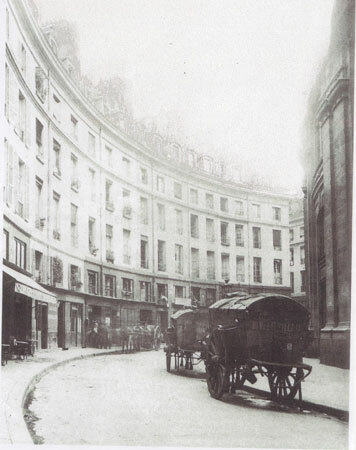 Transforming Paris: the life and labors of Baron Haussmann, David P. Jordan, Free Press, 1995.